"Highlights : Dulhan scheme ap for Muslim brides - AP Minorities Welfare help Poor Muslim marriage application form online|Dulhan Scheme details Apply for AP Dulhan Scheme online Application form on apepass.cgg.gov.in/Dulhan.do | How to apply AP Dulhan Scheme online, Procedure for fill online application form for AP Dulhan Schem | Check status of application for Dulhan Scheme Dulhan Scheme for poor marriage for girls". The Minorities Welfare Department of Andhra Pradesh Government has launched new scheme " Dulhan Scheme" for the marriage of Poor Muslim girls belonging to the minority community.It is Really good news for Andhra Pradesh Muslim.Special Secretary Minority Welfare Andhra Pradesh Shaikh Mohammed Iqbal (FAC) told that Marriages of poor Muslim girls have become a problem hence this scheme has been introduced Andhra Pradesh state Government,Minorities Welfare Departments to provide relief to families facing financial crush. Government have enabled scheme for conducting Mass Marriages of poor Muslims & Christian girls in the State who are below the poverty line. As per the assurance given by the Hon'ble Minister for Minorities Welfare on the floor of Legislative Council, a Committee was constituted to look into the possibility of increasing the amount of financial assistance for conducting of Mass Marriages of Poor Muslim girls from Rs.25,000/-, the eligibility criteria and also the mode of payment. How to Apply AP "Dulhan" Scheme online ? The Prospective bride shall apply on online only for availing the Marriage Incentive.The applicant may apply one month before the date of marriage. Following Documents is require for apply "Dulhan" Scheme. Date of Birth of Bride and Bridegroom. Aadhar card of the bride and bridegroom. A scanned copy of the first page of Bank Pass Book. Latest Photograph of the Bride and Bridegroom. After the beneficiary applies on online and the information shall be forwarded to concerned Tahsildar of the Current Residential Address of the Bride who shall verify the details and forward the same on online to the District Minorities Welfare Officer within one week positively.After the online Application is received from the Tahsildar, the District Minorities Welfare Officer would sanction the incentive on online as per budget availability. 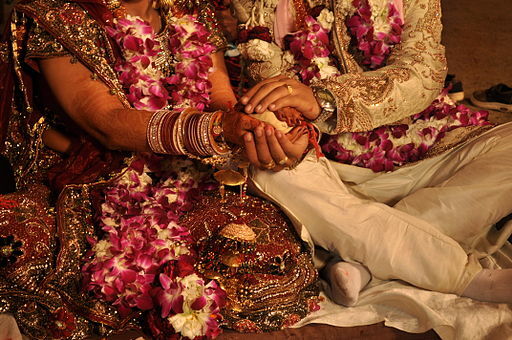 The incentive shall provisionally be sanctioned 10 days prior to the Marriage for the beneficiaries who apply one month before the Marriage and the incentive amount shall be released / credited into the bride’s account only after producing Nikah Nama / Marriage Certificate issued by Khaji / Pastor / any other competent authority within 60 days from the date of Marriage. After the Marriage, the District Minorities Welfare Officer shall verify the performance of the Marriage and confirm the information through online and take action to transfer an amount of Rs.50,000/- through online into the Bride’s Account. How to fill Online application for "Dulhan" Scheme"
You'll see online application form for Dulhan Scheme, Filling the necessary details in the application form. Upload Photograph of Bride-Groom, Age Proof Certificate, Bride's Scanned Aadhar Copy,Bride Groom's Scanned Aadhar Copy, Scanned Bank pass book. Now enter the Digital Code in the mentioned Box. than Click on "Submit", After Submitting the application take print of Application, for future reference. I HAVE NOT PRINT MYT APPLICATION FORM AFTER SUBMITTING AND IN EPASS PRINT APPLICATION WEBSITE IS NOT WORKING ..WHT TO DO NOW? Than Click on "Get Details"
If want B+ AB+ O+ kidney or want to sell kidney for money due to financial breakdown. Contact us +91-8050773651 whatsAap email: davegrayhospitaldelhi@gmail.com for we have patients who face life time dialysis problem unless they undergo kidney Transplantation.